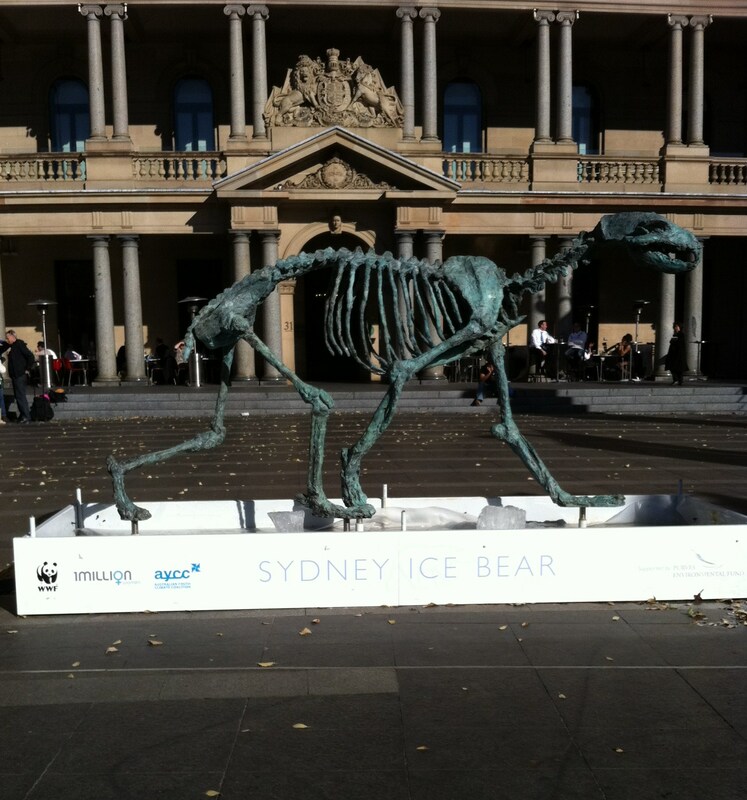 The ice has melted and all that’s the left is the mottled green tarnished bronze skeleton of the Polar Bear. It’s quite haunting and an extremely evocative depiction of our impact on the bears’ environment. Some time ago, my oldest daughter was sitting on the couch multi-tasking. You may do some of this yourself, in my daughter’s case it was watching Trinny and Susannah, chatting on Facebook and reading a blog. She suddenly burst out laughing and announced, ‘Mum, you are so white.’ Yes, true, sun-baking and fake tanning have never been my thing. But apparently she was referring to the fact that I am a left-leaning, inner city type with a fondness for certain kinds of stuff. If you’ve never read or heard of Stuff White People Like then check it out, they have a list of stuff white people like, it’s very funny. But to help you out, here’s a taste of my weekend. 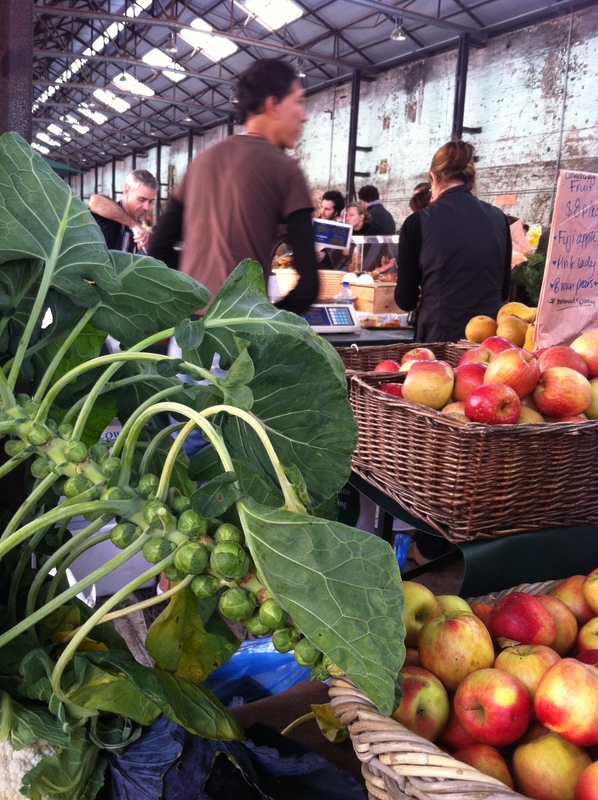 Early Saturday morning I collected the same mocking daughter and headed for the Eveleigh St Farmers Market (#5). In my French Provincial Market basket (not on list, but should be), I had my iPhone (#40), and my Moleskine notebook (#122). 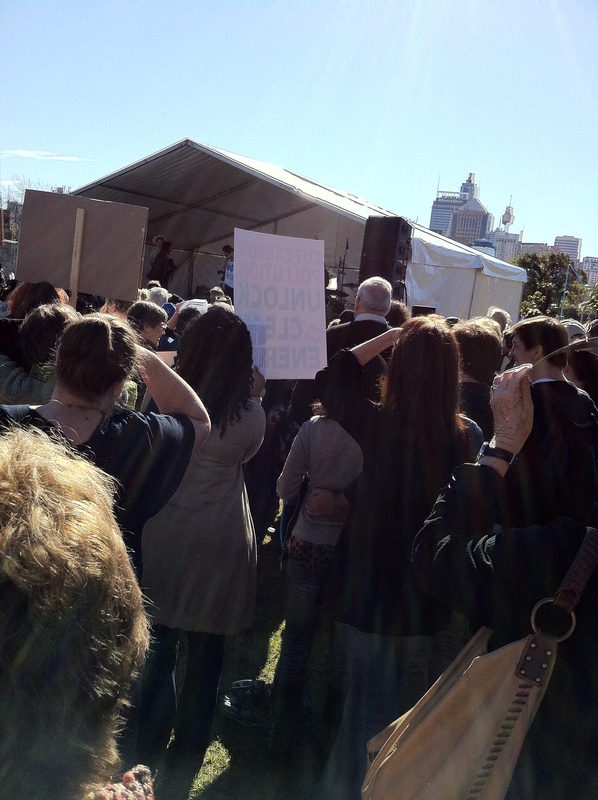 I was wearing a scarf (#97) – The Leopard print one, currently my favourite (see previous post on my scarf addiction). I immediately queued up at the Colombian coffee (#1) stall for my cappuccino, made by a very cool barista wearing trendy-geek glasses. The coffee queue is always the longest, except for the Billy Kwong queue, which is nearly as long as their restaurant queue any given Friday night. Coffeed-up, we made a plan. We’d work our way through the market and then come back for what we needed. We ditched this plan almost immediately when I tried some organic (#6) mandarins and bought them, in case they sold out. And once the wallet was opened the buying began. The produce is fresh and so well-priced, we told ourselves, we bought enough to feed the neighbourhood, forgetting that we’d be back next week to do it all again. After the market we headed up to King St Newtown and wandered in and out of bookshops with community noticeboards offering writing workshops (#21) which, I wouldn’t be doing this weekend, because I did one last weekend. We had another coffee (#1) served by a waiter with the cover of the Joy Division album tattooed on his arm (almost covered by #121) and finally headed home to our respective inner city abodes. That afternoon I did a spot of blogging (another not on the list that should be), checking for any grammar(#99) mistakes and caught up on Facebook (#106), Twitter and read the Spectrum lift out of the SMH while my youngest was having a rest. Over a red wine (#24) with dinner, my husband and I discussed what we might watch – Juno (#57)? Already seen it, and all of The Wire (#85) and Mad Men (#123) so we decided to continue with our complete re-viewing of The West Wing. The weekend was rounded off with a 1 year old’s birthday party and a visit to The Vivid Festival (almost #3) to see the light installations on the Opera House, Customs House and the Museum of Contemporary Art. And there was the melting Ice Bear to check out. There is only one way to end such a White weekend, a good book and a cup of green tea (#13). Filling the Well, creating visual images to draw on, sounds, tastes, touch to stimulate and enrich your writing. Or just because it’s fun and inspiring and gets you away from the desk. This morning was gorgeous on Sydney Harbour. The cool winter sunshine glistened across the water and the ferry chugged its way from Balmain to Circular Quay. I don’t normally catch the 8am commuter ferry and that in itself was interesting. Teenagers heading to school, iPods firmly in ears, 2 women were reading Lynda La Plante novels, men reading newspapers and professional journals. There was plenty of texting, iPad and general tech action happening. Not too much gazing out the window taking in the view. 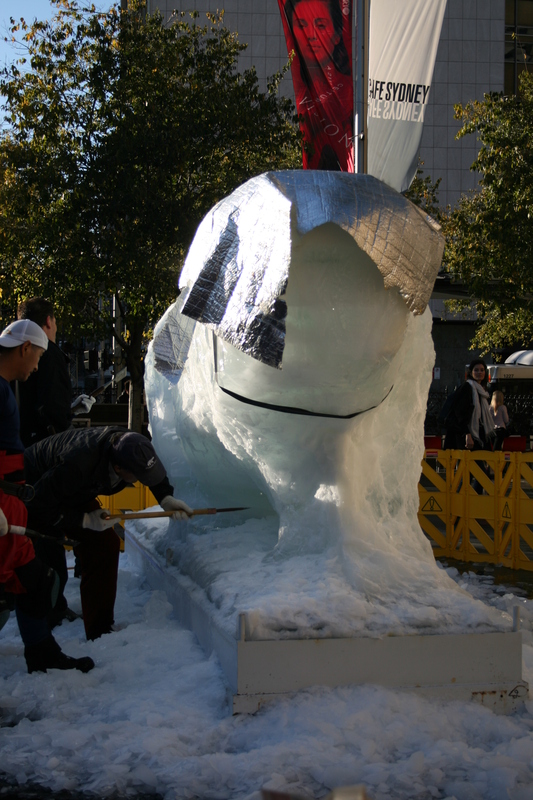 Unlike my fellow passengers, I wasn’t heading to school or work, but to watch Master Sculptor, Mark Coreth create his Ice Bear, a life-sized sculpture of a male polar bear. 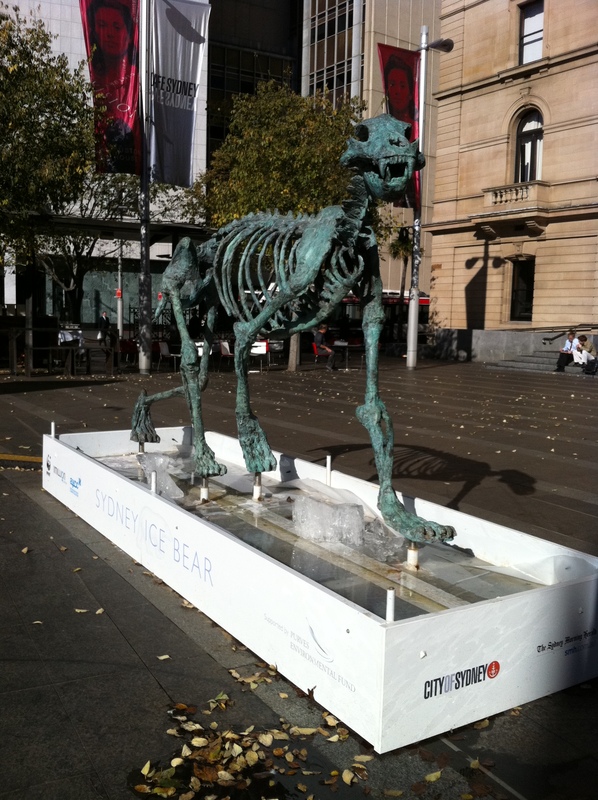 The bear is carved out of a block of ice which will take 3 -4 days to melt, revealing a bronze skeleton of a polar bear, measuring 2.2 metres high by 4 metres long. 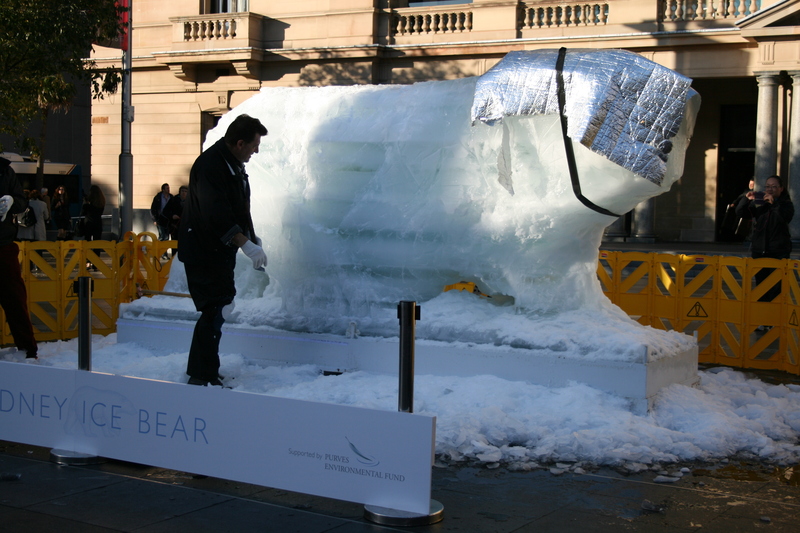 There was a team of 4 ice sculptors at work, including Coreth and they’d started work at 7am in the morning, by the time I arrived it was 8.15am and the bear was already taking shape. 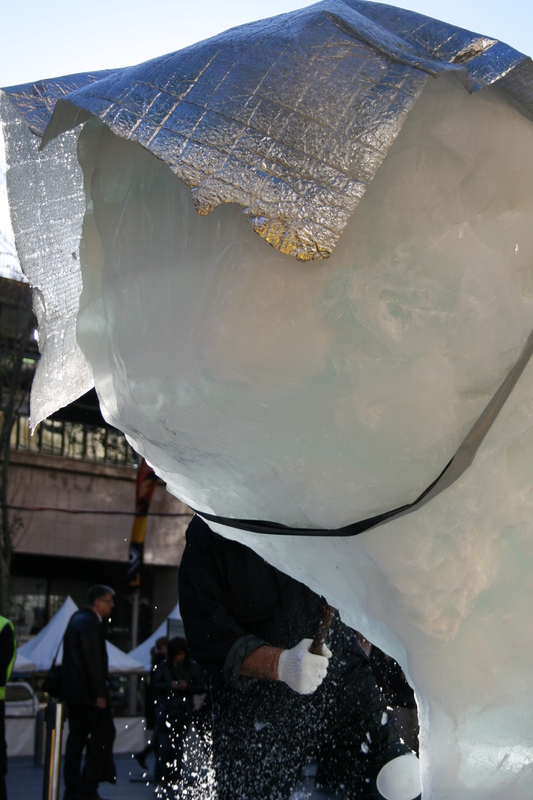 The men worked with long-handled sculpting tools to create a fluid, active ice bear from a rectangular slab of ice. What looked like random stabbing and poking was defining the legs and belly of the bear. It was all a little incongruous. The sculptors were surrounded by the bustle of morning commuters, snatching mobile phone photos as they waited for their lattes and the TV news crews setting up, jostling with the professional photographers for premium bear watching position. 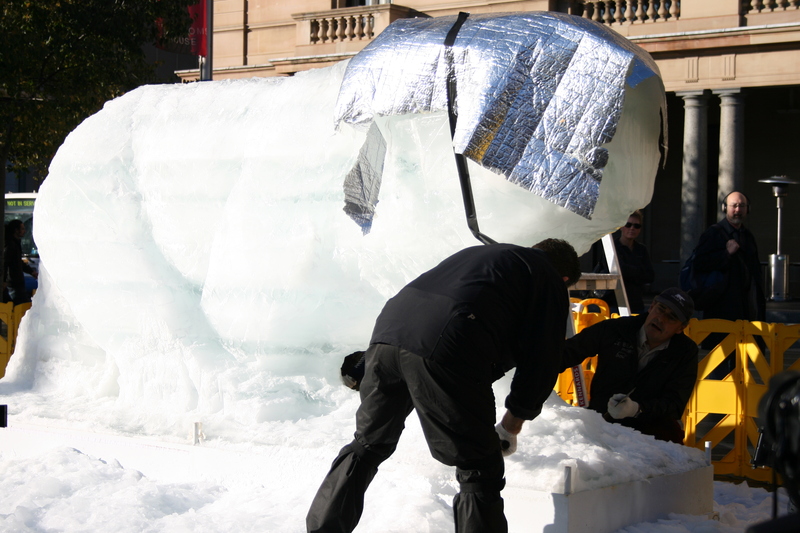 But it was beautiful, the way the sun hit the ice, droplets of water lingering on the bears chin before falling to the plinth, the spray of ice being chipped from the block and the abrasive scrape as the shards of ice were pushed away, watching the sculptors carve out a form. And isn’t that what we try to do as writers? We carve out a form, create an image, shape a piece of work, chip away at a draft from the words at our disposal. 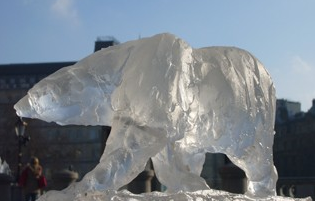 It may have more permanence than the melting ice bear, or it could be a fleeting moment caught in a blog post.